A great early Austrian bronze. Here we have an old ashtray for you with a candle holder. The relief shows two playing boys wearing old dresses, barefoot of course. Even though it is relatively heavy the shipping is, as usual, free here in the US. Good. With patina, no restoration, no repairs, no touch ups! Please do not forget that you are buying a used item that always may show some traces of wear! 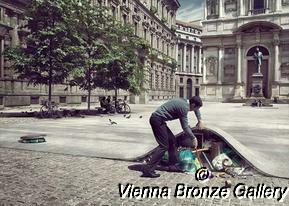 As reputable collectors for more than four decades we offer only authentic Vienna bronzes and fight copycats.